Come on down the Flat & Fast Silver Strand where dreams of PR's can come true! USA Beach Party Finish with "Beach Boys" Cover Band and Beer Garden. Awesome Finisher Medals for all, Tech T's, Live Entertainment on the Run! 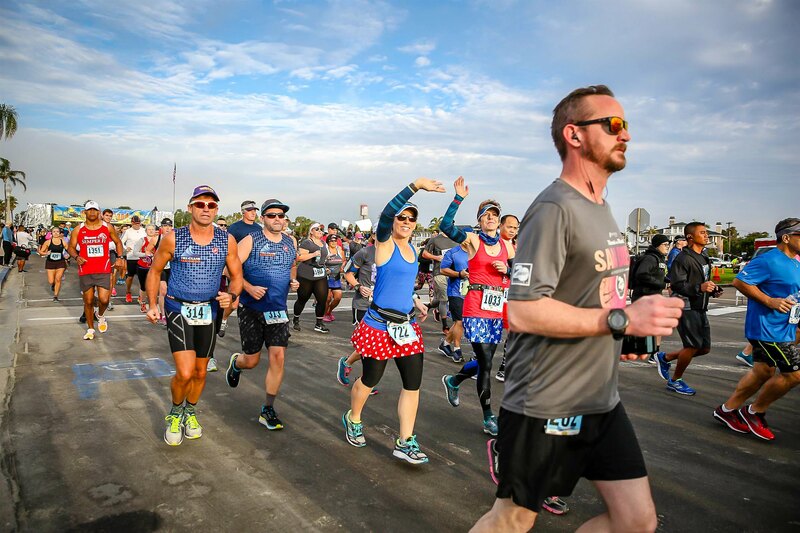 Run with the waves of the Pacific Ocean on your right and the San Diego Bay on your left, finishing with a California Beach Party! 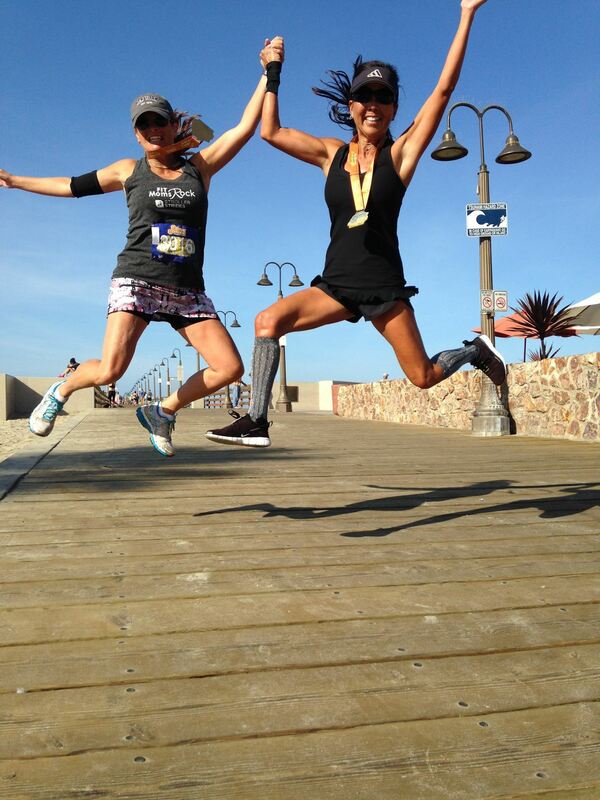 Run along the "Silver Strand," from Coronado to Imperial Beach! The Half Marathon & 10 mile course is limited to 5000 participants. • Men's & Women's sizing Technical T-Shirt for ALL adult Participants! • Road Runner Sports Pace Team- 1/2 Marathon pace groups include: 1:30, 1:40, 1:50, 2:00, 2:10, 2:15, 2:30 and 2:45!! There will be 7 aid stations on the half marathon race course. The water stations are located approximately 1.5 miles apart. Water and energy drinks will be available at all 6 stations. Energy gels will be available at one station near mile 7. Water is also available at both the start and finish areas. 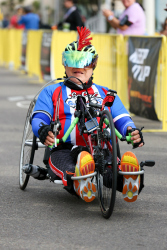 Elliptical, Wheelchair and Handcycle Awards will be given to the top 3 Male & Female. Make your event more meaningful! Sign up to raise funds for the Challenged Athletes Foundation (CAF) through Life Sports Foundation. The funds you raise will help change the lives of physically challenged athletes by giving them the opportunity to live an active lifestyle through physical fitness and competitive athletics. Party at the Pier - After the race, kick back and enjoy the sights and sounds of the Party at the Pier. There will be live entertainment, beer garden, post race food, fluids and massages. Awards - Finisher medals for all distances! Half marathon, 10 Miler and 5K running awards will be given to the top three overall finishers and the top three finishers in each division. 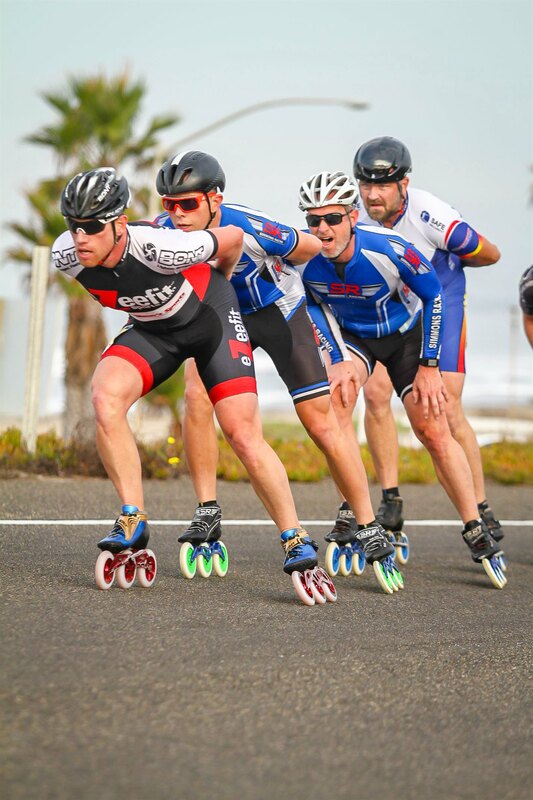 Skate awards will be given to the top three in five year age increments. 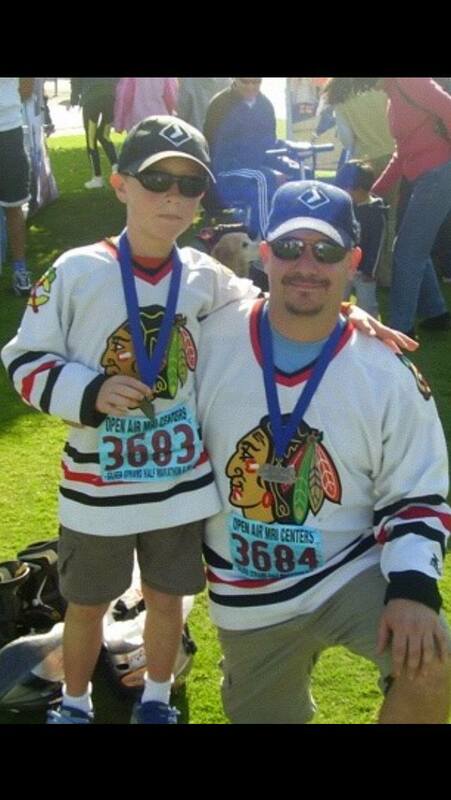 The 5K award ceremony is scheduled for 9:00 am and the Half Marathon/10 Miler awards ceremony is scheduled for 10:30 am. T-Shirts - All participants, excluding youth sizes, will receive a tech tee. Youth sizes will be cotton tees. 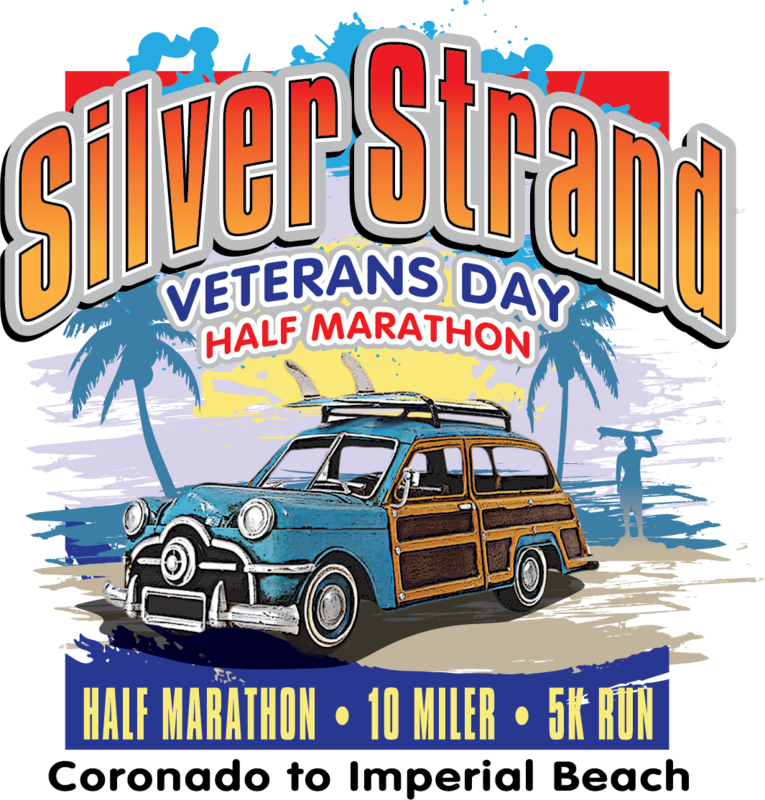 Finisher Medals - All Participants Half Marathon, 10K and 5K get an exclusive Silver Strand Veterans Day race finisher medal. CAN'T MAKE IT TO PACKET PICK UP? Half & 10 milers, who don’t come to packet pickup, must pay a $10 (CASH ONLY) late pick-up fee on race morning, & you MUST bring your photo ID & sign both waivers. 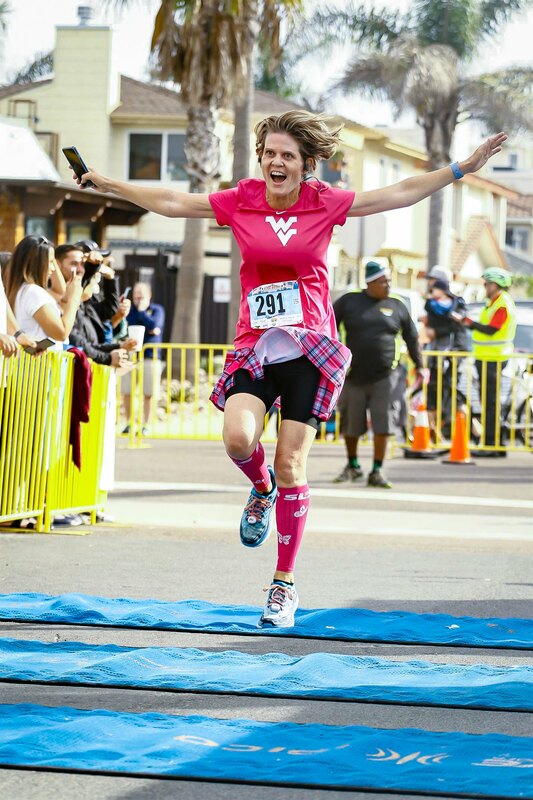 Parking & Getting to the Start Line - Best, Fastest & Surest Way Have a friend drop you off near the start line Ocean Blvd & Marina Ave 6:00 am & 6:45 am Taking Your Car -If You paid for Parking Option 1 check confirmation, bus from Silver Strand State Beach to the start is 5:30 am to 6:45 am overflow parking at the Coronado Cays. Bus will return to the parking after the race. This parking option must be purchased for each person riding the bus, even if they come in the same car. 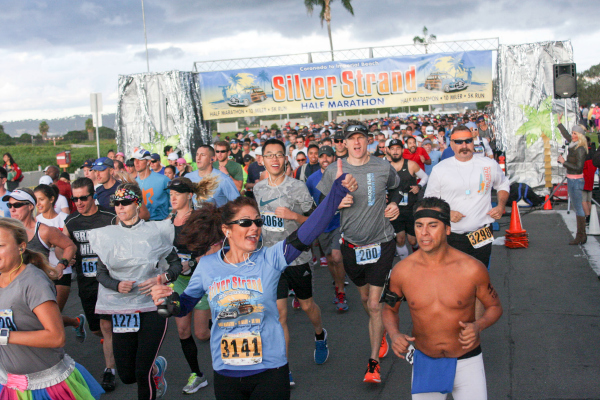 NO 5K'ers WILL BE BUSED TO IMPERIAL BEACH. NO SPECTATORS will be bused to the start. Do not wait until the last moment. Late-comers are not guaranteed a bus to the start. Coronado, limited parking at the Coronado City Hall at Hwy 75 & Strand Way. It is 1m from the start. Bus at the area after 6:15 am or you can warm up to start line. 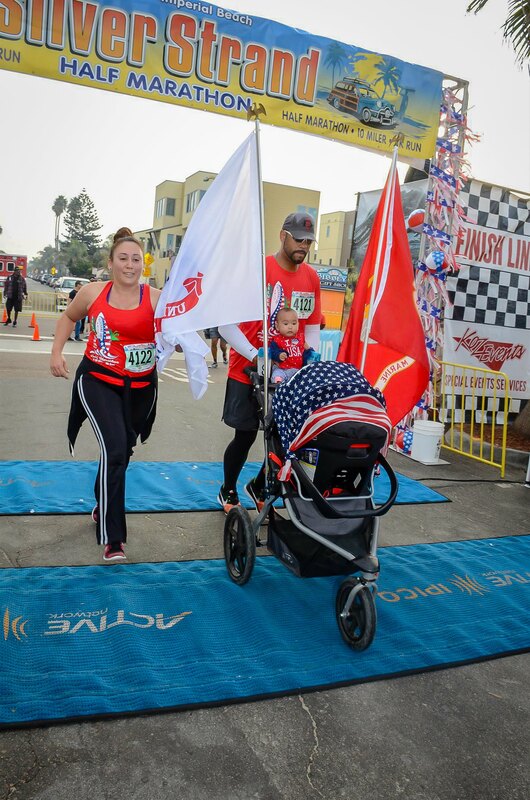 Option 2 –If you selected Option 2, there will be bus service from the Imperial Beach Pier to the start for the pre-selected 300 participants only. This option should be selected for each person riding on the bus, even if they come in the same car. First come, first serve. The buses will depart from Reama Park on 2nd St. in between Elder & Elkwood beginning at 5:30 am for the first 150, & at 6:30 am for the remaining 50. Please plan to arrive at this location by 5:15 am Do not wait to take the 6:30 am departure, or you may be left behind. IF You Arrive Late Park your car in the residential area near the start area. There will be limited bus service from the finish back to the start after the race. What if I want to Change my Distance, Add a Massage or Add Parking?